Background and objectives This analysis from the Nephrotic Syndrome Study Network (NEPTUNE) assessed the phenotypic and pathology characteristics of proteinuric patients undergoing kidney biopsy and defined the frequency and factors associated with complete proteinuria remission (CRever). Design, setting, participants, & measurements We enrolled adults and children with proteinuria ≥0.5 g/d at the time of first clinically indicated renal biopsy at 21 sites in North America from April 2010 to June 2014 into a prospective cohort study. NEPTUNE central pathologists assigned participants to minimal-change disease (MCD), FSGS, membranous nephropathy, or other glomerulopathy cohorts. Outcome measures for this analysis were (1) CRever with urine protein-to-creatinine ratio (UPC) <0.3 g/g with preserved native kidney function and (2) ESRD. Continuous variables are reported as median and interquartile range (IQR; 25th, 75th percentile). Cox proportional hazards modeling was used to assess factors associated with CRever. Results We enrolled 441 patients: 116 (27%) had MCD, 142 (32%) had FSGS, 66 (15%) had membranous nephropathy, and 117 (27%) had other glomerulopathy. The baseline UPC was 4.1 g/g (IQR, 1.9, 7.7) and the eGFR was 81 ml/min per 1.73 m2 (IQR, 50, 105). Median duration of observation was 19 months (IQR, 11, 30). CRever occurred in 46% of patients, and 4.6% progressed to ESRD. Multivariate analysis demonstrated that higher prebiopsy proteinuria (hazard ratio, 0.3; 95% confidence interval, 0.2 to 0.5) and pathology diagnosis (FSGS versus MCD; hazard ratio, 0.2; 95% confidence interval, 0.1 to 0.5) were inversely associated with CRever. The effect of immunosuppressive therapy on remission varied by pathology diagnosis. Conclusions In NEPTUNE, the high frequency of other pathology in proteinuric patients affirms the value of the diagnostic kidney biopsy. Clinical factors, including level of proteinuria before biopsy, pathology diagnosis, and immunosuppression, are associated with complete remission. Primary noninflammatory glomerular diseases, including minimal-change disease (MCD), FSGS, and membranous nephropathy (MN), account for 12% of prevalent ESRD at an annual cost of $3 billion in the United States (1). The major goal of the Nephrotic Syndrome Study Network (NEPTUNE) is to assemble an observational cohort with MCD, FSGS, and MN to support innovative multidisciplinary translational research and advance the field toward effective treatments (2,3). Here, we describe baseline cohort characteristics, early disease outcomes, and address the following questions: (1) What are the characteristics of proteinuric patients undergoing kidney biopsy in North America today? and (2) What are the factors associated with the short-term outcome of complete proteinuria remission (CRever)? Following institutional review board approval and patient/guardian consent and minor assent, eligible patients were enrolled in the NEPTUNE longitudinal cohort study at the time of clinically indicated initial kidney biopsy. Full details of the study design have been published elsewhere (2,3). Eligibility criteria include individuals of any age scheduled for a clinically indicated initial renal biopsy with proteinuria ≥0.5 g/d from 24-hour urine or >0.5 g/g random urine protein-to-creatinine ratio (UPC). Patients with subnephrotic proteinuria were included to capture the broad spectrum of clinical presentations of MCD, FSGS, and MN. Exclusion criteria included patients with clinical or pathologic evidence of other kidney diseases (e.g., systemic diseases, such as diabetic nephropathy, systemic lupus erythematosus, vasculitis, Alport syndrome, amyloidosis, and monoclonal gammopathy), prior solid organ transplant, life expectancy <6 months, and unwillingness or inability to consent. The enrollment goal was 450 participants, with a recruit-to-replace strategy to achieve and maintain 450 active participants. Study visits included screening/biopsy/baseline (which could occur simultaneously or sequentially), then every 4 months in year 1 and every 6 months thereafter. Observation is ongoing. Initial data capture included demographic characteristics; social, medical, and family history; past therapy for nephrotic syndrome; patient-reported outcome; and results of local clinical laboratories. Urine and blood biosamples collected in the baseline and follow-up study visits were used for this analysis. The local biopsy report was masked for identifiers and submitted for core review. Digital images of stained slides are being acquired, stored in the NEPTUNE digital pathology repository, and reviewed. This digital review is not yet complete for all participants reported in this article. The determination of pathology cohort assignment was initially made by review of the local pathology report by one member of the NEPTUNE pathology committee. Where digital images were available, additional detailed pathology image review was completed by a minimum of two members of the NEPTUNE pathology committee to confirm cohort assignment as MCD, FSGS, MN, or other (3). Cases in which light microscopy showed minimal lesions and immunofluorescence and electron microscopy did not reveal other conditions were assigned to the MCD cohort. On the basis of pathology review and laboratory data available following enrollment, patients meeting exclusion criteria were unenrolled. Eligibility urine protein measurements were abstracted from the local patient medical record. Following enrollment, urine samples were collected at each study visit and assayed in the central laboratory. The 24-hour urine protein and creatinine measures were preferentially used for UPC values in this study. When 24-hour urine specimens were unavailable, random urine samples were used. Urine protein was measured via colorimetric dye binding assay and urine creatinine was measured via immunoturbidimetric assay at the urine laboratory at Mayo Clinic, Rochester, MN. Serum samples were assayed for creatinine (using the enzymatic Jaffe method) and for cholesterol, triglycerides, and HDL (by the Cobas Mira Plus chemistry analyzer, Roche, Inc.) at the Michigan Diabetes Research and Training Center laboratory at the University of Michigan. LDL was calculated using the following equation: LDL cholesterol=total cholesterol−HDL−(triglycerides/5) (4). Patients were divided into three categories based on the earliest reported proteinuria value collected at the eligibility assessment: UPC<1 g/g, UPC 1–3 g/g, and UPC>3 g/g. Any exposure to immunosuppression therapy (IST) and renin-angiotensin-aldosterone-system (RAAS) blockade for treatment of kidney disease before or after study entry was captured. IST included steroids, calcineurin inhibitors, cyclophosphamide, mycophenolate mofetil, and rituximab. CRever, defined as UPC<0.3 g/g with preserved native kidney function during at least one visit in the prospective observation, served as the primary outcome for this analysis and was restricted to patients with at least one follow-up proteinuria measurement. ESRD was defined as initiation of long-term dialysis, kidney transplant, or eGFR<15 ml/min per 1.73 m2 on two consecutive study visits. The eGFR was estimated using the Chronic Kidney Disease–Epidemiology Collaboration equation for adults age 18 years and older and the Chronic Kidney Disease in Children–Schwartz formula for children (5,6). Analyses were conducted using SAS software, version 9.2. Baseline characteristics of the sample were described using frequencies and percentages for categorical variables and medians and interquartile ranges (IQRs; 25th, 75th percentiles) for continuous variables. The distribution of variables of interest was compared across three UPC categories (<1, 1–3, and >3 g/g) using chi-squared tests for categorical variables and Kruskal–Wallis tests for continuous variables. Time to first complete remission was analyzed by Cox proportional hazards models. The main covariate of interest was initial UPC category (< 1, 1–3, or >3 g/g). Immunosuppressive exposure was characterized by two variables measuring exposure to IST before and after the baseline visit. Effect modification corresponding to the effect of treatment by cohort was assessed by interaction terms. The inclusion criterion in backward selection was set at α<0.25. Covariates were then removed from the Cox model at a significance level of α<0.05. As of December 1, 2014, 554 patients were enrolled into the NEPTUNE study. Sixty-two participants were excluded on the basis of ineligible kidney biopsy showing systemic or secondary disease (diabetic nephropathy [n=16 (26%)], lupus nephritis [n=3 (5%)], amyloidosis [n=7 (11%)], Alport syndrome [n=1 (2%)], insufficient biopsy material for pathology classification [n=8 (13%)], and pending biopsy review [n=27 patients (44%)]). Fourteen patients were excluded because of a previous biopsy. In addition, withdrawal before biopsy or completing enrollment (n=32) and ESRD at baseline (n=5) contributed to a total 113 ineligible participants (Figure 1). Baseline characteristics of the 441 eligible and active patients are summarized in Table 1. Patients range in age from 1 to 84 years; 66% were adults (age ≥18 years) at the time of biopsy. Of the patients, 24% were black, 14% were Asian, 57% were white, 5% were multiracial, and 21% were Hispanic. Median baseline UPC was 4.1 g/g (IQR, 1.9, 7.7; range, 0.1–59.8), and eGFR was 81 ml/min per 1.73 m2 (IQR, 50, 105; range, 7.1–237.1). A total of 33% reported a family history of kidney disease, including 19 (4%) with ESRD. More than 50% reported a family history of hypertension, and 39% reported a family history of diabetes. Disease duration did not significantly differ between children and adults: 4 months (IQR, 1, 15) versus 4 months (IQR, 1, 24) (P=0.87). A total of 196 (44%) of patients were exposed to IST before their baseline visit: 188 (43%) exposed to steroids, 52 (12%) to calcineurin inhibitors, 19 (4%) to cyclophosphamide, 28 (6%) to mycophenolate mofetil, and two (1%) to rituximab. There were also 278 patients (63%) who had been previously treated with RAAS blockade. At study eligibility assessment, 50 (11%) patients had a UPC<1 at enrollment, 125 (28%) had a UPC of 1–3, and 266 (60%) had a UPC>3 g/g (Table 1). Patients with the lowest level of proteinuria were equally likely to have FSGS, MCD, or other diagnosis. Those with MCD and UPC<1 g/g (n=15) included five children with prebaseline IST and nine individuals ranging in age between 9 and 51 years without prebaseline IST. The eGFR in the group with MCD and a UPC<1 g/g was well preserved at 96 ml/min per 1.73 m2 (IQR, 81, 105). Conversely, the eGFR of the FSGS and UPC<1 g/g group was 77 ml/min per 1.73 m2 (IQR, 56, 103). Patients with nephrotic-range proteinuria (UPC>3 g/g) were more likely to have had a short duration of disease before biopsy and to have edema (51%) and a history of IST. They were also more likely to have MCD (31%) or FSGS (29%) than MN (19%) or other diagnosis (21%) on biopsy (P<0.001). NEPTUNE patient pathology included MCD (n=116 [27%]), FSGS (n=142 [32%]), MN (n=66 [15%]), and other diagnosis (n=117 [27%]) (Table 2). The distribution of pathology varied by patient age (P<0.001), with MCD most common in young children and MN most common in older adults. FSGS and other diagnosis were present in all ages (Figure 2). The other pathology diagnoses included IgA nephropathy (n=55 [47%]), immune complex–mediated glomerulopathy (n=41 [35%]), C1q nephropathy (n=5 [4%]), thin basement membrane disease (n=5 [4%]), crescentic GN (n=3 [3%]), nodular glomerulosclerosis (n=3 [3%]), membranoproliferative GN (n=2 [2%], IgM nephropathy (n=2 [2%]), HIV nephropathy (n=2 [2%]), thrombotic microangiopathy (n=1 [1%]), interstitial nephritis (n=1 [1%]), postinfectious GN (n=1 [1%]), nephrocalcinosis (n=1 [1%]), hepatitis C nephropathy (n=1 [1%]), sickle cell nephropathy (n=1 [1%]), and nondiagnostic (n=1 [1%]). Percentages exceed 100% because eight patients had multiple coexisting diagnoses. Other pathology diagnoses were observed across the age (range, 1–84 years), proteinuria, and prebiopsy immunosuppression categories. A total of 17 (3.8%) local pathology diagnoses were changed between local and central pathology review on the basis of the NEPTUNE research classification and adjudication criteria. Most of these were minor changes between FSGS and MCD classification. Table 3 displays the subset of 413 cohort participants eligible for the CRever analysis with median duration of observation of 19 months (IQR, 11, 30). Of the patients, 118 (46%) achieved CRever during observation, and 41% reached CRever by study month 12 (Figure 3). In bivariate analysis, individuals with CRever were younger; less likely to have a family history of kidney disease; and most likely to have MCD, have a higher eGFR, and have been exposed to IST before the baseline visit compared with the persistent proteinuria group. According to a multivariable Cox proportional hazards regression analysis (Table 4), CRever was associated with a UPC<1 g/g at the time of kidney biopsy and MCD. There was a significant interaction between IST and disease cohort where IST exposure was associated with CRever for patients with FSGS. For patients with MN, prior IST was also associated with an increased likelihood of CRever. CRever was least likely in individuals with a UPC>3 g/g, FSGS, and no IST. Variables that were assessed in this Cox model but not found to be significant predictors of CRever included family history, age, weight status, eGFR, and lipid profile. A sensitivity analysis that excluded patients with IST before NEPTUNE baseline confirmed the associations between baseline proteinuria and renal pathology with CRever (data not shown). A second sensitivity analysis was conducted with the NEPTUNE cohort stratified by children (<18 years) and adults (≥18 years). While this analysis was limited by sample size, the findings of proteinuria, pathology cohort, and therapy continued to be predictors of CRever within each age strata. Finally, 20 (4.5%) participants reached ESRD during NEPTUNE follow-up and two (0.4%) had died as of December 1, 2014. The subset that progressed to ESRD had a very low eGFR at baseline of 19 ml/min per 1.73 m2 (IQR, 12, 34) and renal pathology diagnosis of FSGS (n=9 [45%]), MN (n=1 [5%]), or other (n=10 [50%]). Two patients died in the MN cohort, at 28 and 31 days from enrollment, of pulmonary embolism (n=1) and infection (n=1). Nine kidney biopsy–associated serious adverse events were reported in the 554 enrolled patients; these events included bronchospasm, hematoma, hemorrhage, and visceral arterial ischemia. All patients subsequently recovered from these events. NEPTUNE is the first multisite, prospective study designed to enroll individuals with proteinuria at the time of their initial, clinically indicated kidney biopsy along with the characterization of the phenotype, pathology, and collection of a diverse set of biospecimens (2). Although NEPTUNE was designed to focus on MCD, FSGS, and MN, patients with other pathology diagnoses were retained in the cohort to serve as a scientifically relevant comparison group. This provides an opportunity to identify common and distinct mechanisms and determinants of disease progression across multiple proteinuric conditions. The original enrollment goal of the cohort was 450 participants. An expansion of the target cohort was approved to allow enrollment beyond the original target. Within the initial 554 individuals, eight were excluded because of inadequate biopsy (1.3%), nine experienced a biopsy-associated adverse event (1.4%), and 441 completed all enrollment visits and met eligibility criteria at the time of the data freeze for this analysis. Of the cohort, 11% (n=50) had a UPC<1 g/g before kidney biopsy. Within this low-proteinuria group, a significant percentage had MCD (30%), FSGS (32%), or MN (6%) as opposed to other diagnoses (32%). Only 16% of individuals in this low-UPC group were treated with IST before baseline. For those with prior therapy, the subnephrotic UPC may indicate partial proteinuria remission. These findings suggest that renal pathology is identifiable and kidney biopsy is a valuable diagnostic tool even in the setting of low-grade proteinuria. The cohort observation will need to be longer in order to evaluate the long-term risk for disease progression in this minimal proteinuria group. Overall, the distribution of pathology within the NEPTUNE cohort was as follows: MCD in 27%, FSGS in 32%, MN in 15%, and a variety of other renal pathology diagnoses in 27%. The frequency of MN was less than expected despite enrollment of participants in 21 academic centers. The distribution of pathology varied by age, with MCD most common in childhood, MN most common in older adulthood, and FSGS and other diagnoses consistently present throughout the age continuum. All renal pathology categories were represented across all age groups except for MN, which was absent in children <10 years of age. When we compared the biopsy distribution in NEPTUNE with that in other pathology-based registries and cohorts in the southeastern United States, Saudi Arabia, Japan, and Scotland, NEPTUNE had an FSGS fraction similar to that in Saudi Arabia and Scotland (NEPTUNE, 32%; Saudi Arabia, 28%; Scotland, 28%), a greater fraction that that in Japan (6%), and a fraction lower than that in the southeastern United States (46%) (7–10). MCD was more common in NEPTUNE that in the other registries (NEPTUNE, 27%; southeastern United States, 13%; Saudi Arabia, 18%; Japan, 15%; Scotland, 18%). This may be related to the age distribution of the NEPTUNE cohort (33% children) as well as the inclusion of "minimal lesion" in the MCD cohort. MN was present in 10%–15% of these comparison registries, with the exception of the southeastern United States with 31%. Variation in the prevalence of specific glomerular diseases may be due to ancestry, age of the patient sample, and referral bias resulting from specific academic medical center expertise. The presence of other kidney diseases in all NEPTUNE age groups has potential significance for children, who are often treated empirically with immunosuppression before initial kidney biopsy. Pretreatment biopsy in children as well as adults may identify unexpected diagnoses with management implications. A striking finding was that 46% of the cohort achieved a complete remission, including 75% of patients with MCD, 34% of those with FSGS, 31% of those with MN, and 41% of those with other diagnoses. Previous publications reported frequencies of complete remission ranging from 70% to 87% in MCD, 20% to 34% in FSGS, and 60% in MN. This published MN estimate includes spontaneous remission as well as remission after therapy (11–14). Frequencies of complete remission in NEPTUNE were similar for MCD and FSGS but were lower for MN. This may be related to the short minimum duration of observation required for this initial report and the longer time from diagnosis to remission that may be required for MN compared with MCD and FSGS (14). Significant predictors of CRever included initial proteinuria, kidney pathology, and IST in the FSGS and MN cohorts. While these were expected predictors, the absence of eGFR, serum albumin, age, and race as statistically significant predictors is noteworthy. Age was a predictor in bivariate analysis. However, when pathology was inserted into the regression model, age was no longer a significant predictor of CRever. Published literature suggests that black race would be predictive of worse outcomes. However, in this study race was not associated with CRever. In epidemiologic studies, Apolipoprotein L1 (APOL1) high-risk genotypes have been associated with poor renal outcomes in individuals of African ancestry (15,16). Because a published subset analysis of 90 NEPTUNE patients of African ancestry found APOL1 to be associated with complete remission and eGFR loss (17), future NEPTUNE studies will benefit from incorporation of complete APOL1 genotyping. IST was not a significant predictor of CRever among patients with MCD. This may be related to pediatric biopsy practices in which steroid-responsive nephrotic syndrome cases are not biopsied. A total of 5% of participants have progressed to ESRD (4.5%) or have died (0.4%). Analysis of the association between proteinuria remission and kidney survival will be the subject of future analysis when the NEPTUNE cohort has a longer duration of observation. This study has limitations. First, approximately 40% of patients received IST before enrollment. Future studies will benefit from prospective longitudinal observation of a contemporary cohort of patients with initiation of prospective observation prior to IST. Second, the study did not capture the number and characteristics of individuals who met eligibility criteria at each center but did not participate in NEPTUNE. Consequently, this study cannot report on the incidence or prevalence of primary proteinuric kidney diseases. Finally, additional longitudinal observation is required to fully capture remission and progression outcomes. In summary, the NEPTUNE study identified MCD, FSGS, and MN in all segments of the prebiopsy proteinuria spectrum from 0.5 g to nephrotic range. 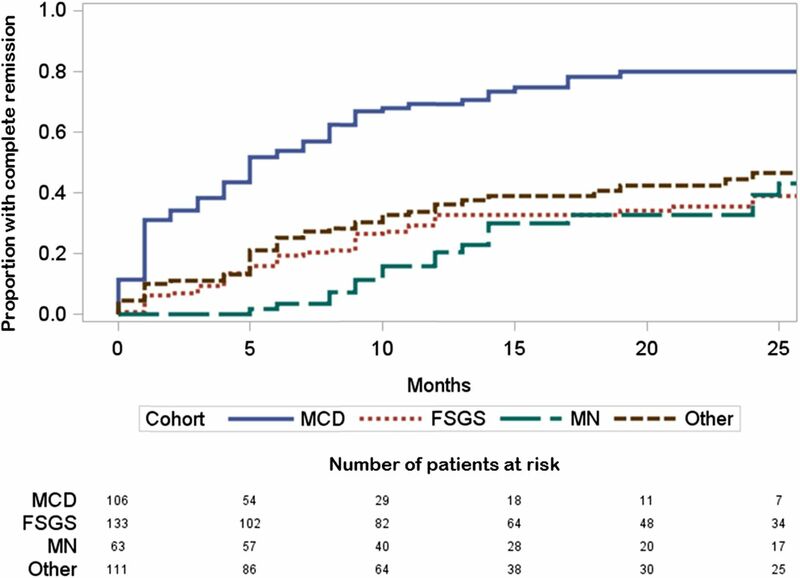 The relative frequency of pathology diagnoses of MCD (27%), FSGS (32%), MN (15%), and other (27%) included the expected frequency of MCD and FSGS, less MN, and more other diagnoses. The finding of other diagnoses in one quarter of patients supports the use of the kidney biopsy across the age and proteinuria continuum to aid in the assessment of diagnosis and prognosis. The finding of other diseases in individuals with prebiopsy immunosuppression suggests that earlier kidney biopsy may be used to inform earlier and more specific treatment decisions. Proteinuria at the time of biopsy recommendation, pathology, and IST were predictive of CRever. However, age and race were not predictive of proteinuria remission. While the 46% complete remission rate is encouraging, further discoveries of early markers for diagnosis, prognosis, and active therapeutic targets are needed to improve the precision of medical care and outcomes for children and adults with nephrotic syndrome. NEPTUNE is sponsored by the National Institutes of Health (NIH)/National Center for Advancing Translational Sciences and NIH/National Institute of Diabetes and Digestive and Kidney Disease (U54DK083912), NephCure Kidney International, and University of Michigan. Most NEPTUNE participating sites are supported by the NIH-sponsored Clinical and Translational Science Awards and their clinical research–supported facilities. This article contains supplemental material online at http://cjasn.asnjournals.org/lookup/suppl/doi:10.2215/CJN.02560315/-/DCSupplemental.